Perhaps a local music school. Plenty of potential teachers studying at the universities and music schools. I remember how many of my colleagues wanted to find students when I was studying. Very cool indeed that FiddleHed attached a customized MP3. Lots of fun with the lessons. Hope you find a local teacher too, I don’t think it matters if a teacher is classical trained or not. The most important thing is that you have faith in the teacher and that he or she will teach you what you want to learn. Most teachers know a lot of different genres. Thanks @mookje I have a number of feelers out for a teacher based on recommendations folks have given me here on the forum. Thanks @mookje I went to your YouTube site. I am very impressed with your ability after just one year (The butterfly / Fig for a kiss). And, I watched a few other videos you posted. Looks like you live in a beautiful area. Thanks for the encouragement. I appreciate it. Thanks for the kind words about my Blog. I just put up two new posts this morning. One about conditioning exercises and the other about the new chin rest I put on my fiddle. Don't stop that from recording yourself playing. It's good as a tool to watch back yourself for learning: (listen to your intonation, watch your bowing in a way you can't in the mirror) and it's also just fun to look back on in a few months or years. I recorded my first day with my fiddle so I'd have something to look back on and remember where I started 😀 I never intended it to share, but did eventually. I want to get a camera and microphone for my PC, but have to wait a bit after spending money on my fiddle and lessons. I do have a smart phone, for the past few months, but I have never even taken a picture with it, never mind a video. Maybe I have to start there first. I would like to record these basic tunes I am doing now, so I can listen/watch them a few months down the road. In the beginning I just used my phone to record myself, since it was the most handy. I still use it a lot, it doesn't do too bad at recording the fiddle. I also record on a smartphone. Here is my first ever recording! It is a basic playing of Bile 'em Cabbage Down. I recorded it in haste, and the sound quality is not that great, but I recorded it on the basic settings. I will have to look at all the settings to see if I can get better quality sound, but for now it serves it's purpose. Sounding good MoonShadows! Believe it or not that little tune will come up at jams especially the ones aimed more at beginner level players. It could be something you want to keep under your fingers. Maybe even learn the variations fiddlehed has. That and cripple creek come up alot sometimes in A sometimes G. Keep it up! Sounding good. I really like and appreciate Jason’s (he's Fiddlehed) approach to teaching. If you read my blog post, Deliberate Practice (https://fiddlingforolderfolks.com/disciplined-practice/), you read about K. Anders Ericsson, a leading researcher and authority in the psychological nature of expertise and human performance and his Major Principles of Deliberate Practice. These Principles are Dr. Ericsson’s synthesis of over 30 years of studying expert performance in many fields, such as medicine, music, and athletics, and how structured, sustained, consistent, and purposeful hard work (read: practice) is how expert practitioners in their field of work acquire their superior performance. For Ericsson, it’s not the length of practice (the debunked 10,000 hour rule), but the quality of practice that counts. After reading about Ericsson’s research, it became quite apparent to me that this was the outline Jason was using in structuring the Fiddlehed Online Lessons, and this was confirmed by Jason in an email after I asked if he was familiar with Ericsson’s work. Jason has read Ericsson’s book, Peak, and is incorporating Ericsson’s philosophy and principles into his Fiddlehed Online Lessons. I'm very happy with Fiddlehed. 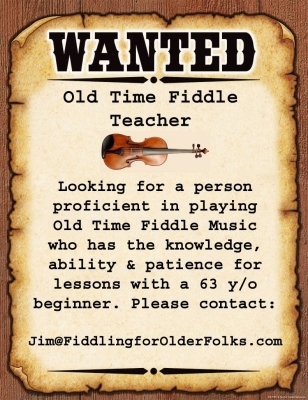 If you are like me, someone who hasn't gotten a teacher yet, or even someone who does have a teacher but wants additional lessons, I think Fiddlehed is a good choice. Sending this card (@4" x 5") to some of the colleges in my area and keeping some in the car to post on any community bulletin boards. I'm pretty much shying away from seeking a classical violin teacher. While I need to learn violin basics, from everything I have read, having a classical violin teacher would be like going to a cardiologist for a joint problem when what I need is an orthopedist. Both are doctors, and know human anatomy and systems, but they specialize in different areas of interest. 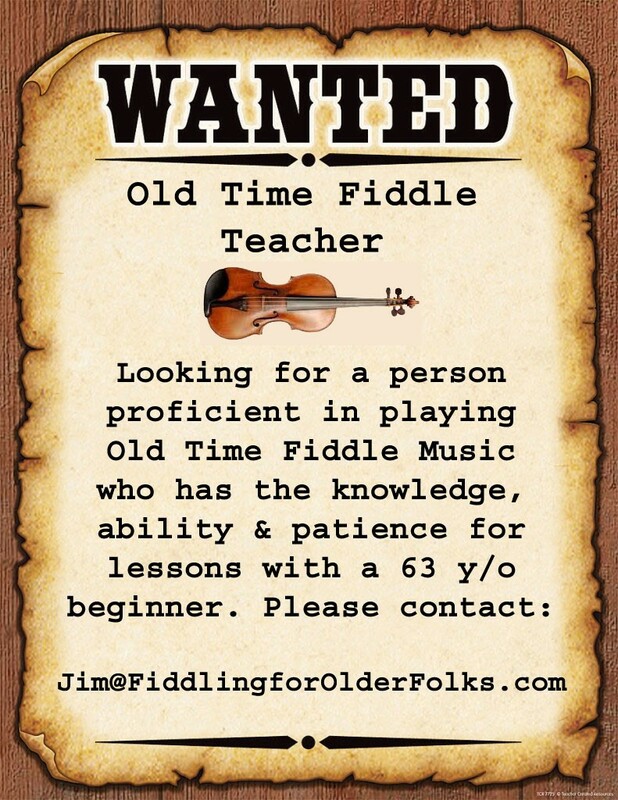 That's why I am seeking someone with Old Time Fiddle experience. I'll let you and the Fidderman community know if I get any "bites". I now have a fiddle teacher. Her name is Betty Druckenmiller and she teaches out of Meadowood Music in Blandon, PA. My lessons will be 1-2 times a month. It is a long 120 mile round trip, but I think it will be worth the effort. She sounds like a good match for what your wanting, GL with lessons. Glad you are motivated enough to drive it though.